Here is the list of the hotels near Bourgbarré. Book your hotel near Bourgbarré today, Thursday 16 May for the best price, reservation and cancellation free of charge thanks to our partner Booking.com, leader in on-line hotels reservation. Below here is the list the 50 closest hotels of Bourgbarré, sortable according your criteria. You will find the position of these accommodations on the Bourgbarre hotels map. Located in Saint-Erblon, La Demeure de l’Isle offers B&B accommodation in a 200-year-old Breton farmhouse 13 km from Rennes. It offers free WiFi access a private parking and a large garden. Rooms and suite feature wooden beams and wooden floors and a private bathroom with a shower. One room features a terrace and is suitable for guests with reduced mobility. A continental breakfast with homemade organic products such as yogurt, jam and cakes is served every morning at Demeure de l’Isle. Fruit, cereal and bread is also served. The shared living room has free newspapers, books, board games and a piano. Tea and coffee making facilities are also provided. The B&B is 3.5 km from the motorway Rennes-Nantes and Rennes Airport is 16 minutes' drive from the property. Offering a seasonal outdoor pool and a 6000 m² garden, Ker Gaston des Bois is set in Pont-Péan. The Rennes Exhibition Centre is a 9 km drive away from the property. Each suite comprises a bedroom and independent lounge with a flat-screen TV and a sofa and a private bathroom Extras include free toiletries and a hairdryer. Other amenities at Ker Gaston des Bois include a hot tub. Table d’hôte dinners are available upon request and at an extra cost. Rennes is 12 km from Ker Gaston des Bois, while Vitré is 39 km away. The nearest airport is Rennes Airport, 11 km from Ker Gaston des Bois. Offering a restaurant, Hotel Bel Air is located in Crévin, just 18 km from Rennes. It offers free Wi-Fi internet access, an on-site bar and a garden. The air-conditioned rooms at Hotel Bel Air will provide you with a flat-screen TV, and satellite channels. Featuring a shower, private bathrooms also come with a hairdryer. A buffet breakfast can be enjoyed every morning from 6:00 to 10:00 at Hotel Bel Air, and other meals are served in the hotel’s restaurant. Other facilities offered include luggage storage. The property is 39 km from Châteaubriant and a 50-minute drive from Saint-Malo. Featuring free WiFi throughout, Chambre d'hôtes Aux Portes de Rennes offers accommodation in Chartres-de-Bretagne, a 15-minute drive from Rennes' city centre. The property is within 5 km from the convention centre and PSA Peugeot - Citroen Factory. The property has free WiFi. All rooms have a flat-screen TV, a private bathroom and offer garden views. Guests are invited to enjoy breakfast every morning and it can be served from 06:00 in case of early check-in. The nearest airport is Rennes - St Jacques Airport, 6 km from Chambre d'hôtes Aux Portes de Rennes. Housed in a 17th-century building, La Malcotais is 3 km from the centre of Noyal-Châtillons-sur-Seiche. It offers a garden and rooms with free Wi-Fi access and a TV. Each room has a private entrance, a seating area and a bathroom with a shower. Some rooms feature a kitchenette. A continental breakfast with pastries is served every morning in the dining room, by the fireplace. Restaurants can be found a 5-minute drive away. La Malcotais is 9 km from the centre of Rennes and 5 km from the Bréquigny Park. Free private parking is available on site. Located just 3 km from the Exhibition Park and Rennes Saint-Jacques Airport, Hotel The Originals Rennes Sud La Chaussairie is 4 km from the PSA Peugot Citröen Centre and 8 km from the centre of Rennes. It is composed of 2 buildings, one with hotel rooms and the other with self-catering rooms equipped with a kitchenette. They all have free Wi-Fi access and a private bathroom. Free private parking is available on site and there is a fitness centre at the property. With an indoor swimming pool and a restaurant, Domity’s L’Arbre d’Or is located in Laillé. This senior residence offers free WiFi access, a garden and a terrace. A shared living area is also available. Serviced by a lift, the air-conditioned apartments feature a seating area with a flat-screen TV. A private bathroom with free toiletries, a shower, bathrobes and slippers is available in each apartment. Guests can prepare their own meals at Domity’s L’Arbre d’Or. Each apartment includes a kitchen with kitchenware, a microwave and a fridge. A stove is also provided. This property is 16 km from Rennes-Saint-Jacques Airport and 20 km from the centre of Rennes. Free private parking is possible on site. Côté Sud is 4 km from the centre of Vern-sur-Seiche and 1 km from the centre of Rennes. It offers free Wi-Fi access, a garden and a terrace. A shared living room with bookshelves is available. The 2 rooms at Côté Sud are individually decorated and feature a bath or shower. Guests have access to shared toilet facilities. Some rooms offer garden views. A daily breakfast can be enjoyed at the property and a shared kitchen is at guests’ disposal. This B&B is 13 km from La Freslonnière Golf Course and free private parking is available on site. It is 20 metres from Bus 62 Stop and a 10-minute drive from Poterie Metro Station. This B&B is located 2 km from Chantepie town centre and 4 km from the centre of Rennes. It has a garden with flowers and it offers free private parking. Each room includes a flat screen TV with a DVD player and free Wi-Fi access. The rooms have a classic decor, views of the garden and some feature exposed stonework. After having the continental breakfast in the breakfast room, you can relax in the hot tub, available at an extra cost. Saint-Jacques airport is a 20-minute drive from this B&B. La Poterie SNCF Train station and La Poterie Metro Station are both 10 minutes away by car. Hotel Premiere Classe is a 10-minute drive from central Rennes. Set in a quiet area with garden, it offers modern accommodation with free Wi-Fi and free on-site parking. Each room comes with a private bathroom and a flat-screen TV with TNT channels. Hotel Premiere Classe serves a daily buffet breakfast in the dining area. There is also a terrace where guests can read the complimentary newspapers. There are many restaurants nearby. Premiere Classe hotel is a 15-minute drive from St. Jacques Airport and the Exhibition Centre, and 3 km from the N136/E50 motorway. Hotel Chantepie Preferred hotel ! Situated on the outskirts of Rennes, 5 km from the town centre and 10 km from the airport, the Comfort Hotel Rennes Chantepie offers easy access to the region's motorways. All rooms have a flatscreen TV with satellite channels, free WiFi, tea and coffee making facilities, a desk and a private bathroom. The hotel also has a conference room equipped with a projector. A buffet breakfast is served daily. The hotel's restaurant is open from 19:00 to 22:00 Monday to Friday. Free private parking is available. Ideally located close to Rennes, Etap Hotel Rennes Chantepie welcomes you for a family break, a business trip or a stopover on your way to your holiday destination. Chose among 65 rooms which can all accommodate up to three people. Family rooms are also available to those travelling with children. For your utmost comfort, all rooms are equipped with a full bathroom. The hotel also boasts free wireless internet access and a free parking, making it a great base for a business trip. Professionals will also enjoy easy access to the area's major roads and to the exhibition grounds located about 15 minutes from the hotel. Apartment Chantepie Preferred hotel ! Located in Chantepie, Appartements T2 Proche de Rennes features accommodation with a flat-screen TV and a kitchen. Complimentary WiFi is available. Each unit features an oven, microwave, a coffee machine, as well as a toaster and kettle. There is a seating and a dining area in all units. The apartment offers a barbecue. If you would like to discover the area, hiking is possible in the surroundings. Ouest France Headquarters is 4.3 km from Appartements T2 Proche de Rennes. Rennes Airport is 14 km from the property. Located in the village of Chantepie, 2 km from Rennes, this B&B is set in a 15th-century manor house, is surrounded by a park and offers rooms and cottages. Free private parking is available. A TV and free Wi-Fi access are included in all accommodation at Manoir de la Haute Pilais. Some accommodation types have a kitchenette and a private entrance. A French-style breakfast is served daily in the dining room. Rennes Train Station and the Museum of Brittany are both a 15-minute drive from the B&B. There is a bus stop 500 metres away. Rennes - Saint-Jacques Airport is a 20-minute drive away. Located in Domloup , La Métairie De Domloup features a garden, furnished terrace and table tennis. It is 1 km from Châteaugiron and a 15-minute drive from Rennes. All rooms feature countryside views, a seating area and a desk. The en suite bathrooms are complete with bathtub and a hairdryer. A continental breakfast serving homemade products is available and an evening meal including regional and homegrown ingredients is offered upon reservation. A shared kitchen is also provided to prepare meals. Additional facilities include bicycles, newspapers, meeting facilities and free Wi-Fi access. The property is 21 km from Saint Jacques Rennes Airport and free private parking is possible on site. Located in the heart of the medieval city of Châteaugrinon, near Rennes, the Auberge du Cheval Blanc welcomes you in a warm and friendly atmosphere for an authentic stay. The hotel has 12 very comfortable rooms. They are all equipped with Satellite LCD television, and Internet wireless connexion. The hotel features a restaurant offering a traditional cooking, and a private parking. La Pommeraie Manor sits in a large peaceful park in Bruz, a 15-minute drive from Rennes Airport. It offers modern apartments, all fully furnished, soundproofed and equipped with free Wi-Fi. Each apartment comes with self-catering facilities including a refrigerator and a microwave. Guests can have their meal in their own private dining area and enjoy a continental breakfast at the residence La Pommeraie. All of these spacious accommodations have tiled and wooden floors and feature a living room with flat-screen TV and work desk. La Pommeraie provides several meeting and reception facilities, and it is a 10-minute drive from Rennes Exhibition Centre. A laundry service is also available and free private parking is possible on site. Featuring free WiFi, Chambres Kersandexupery offers accommodation in Janzé, 22 km from Rennes. Free private parking is available on site. Each room is equipped with a courtesy tray with a kettle. Guests can prepare breakfast in the comfort of their room. Each room has a private entrance and a private bathroom with a hairdryer. Guests can enjoy various activities in the surroundings, including horse riding and cycling. Vitré is 28 km from Chambres Kersandexupery, while Fougères is 49 km away. The nearest airport is Rennes Airport, 22 km from the property. Situated just outside Rennes, 1 km from la Poterie Train station, Hôtel Restaurant Les Loges is set in a peaceful countryside location, close to Rennes' ring road. It offers free Wi-Fi and free parking. Guest rooms at the Loges include a flat-screen TV with satellite channels, free Wi-Fi and a telephone. Also provided in the en suite rooms is an electric kettle and a work desk. A buffet breakfast is served daily and includes organic coffee and pastries prepared by the property's pastry chef. There is a restaurant offering traditional cuisine (open during the week). In summer, meals can be enjoyed on the terrace. Guests may also order a meal tray. Free private parking is available on site. Guests can reach Rennes city centre within 15 minutes by train. Rennes - Saint-Jaques Airport is 12 km from the property. Located in Chantepie with Ouest France Headquarters nearby, Studio Galerie offers accommodation with free WiFi. Some units also have a kitchenette equipped with a microwave. The nearest airport is Rennes Airport, 11 km from the apartment. Set in Bruz, 3 km from Le Grand Logis Cultural Centre, Au Patis De Cahot offers accommodation with free WiFi and access to a garden with a terrace. The bed and breakfast offers a seating area with a flat-screen TV and a private bathroom with free toiletries, a hair dryer and shower. Guests at Au Patis De Cahot can enjoy a continental breakfast. The nearest airport is Rennes Airport, 10 km from the accommodation. B&B Hôtel Rennes Sud Chantepie is set in Rennes, 4.3 km from Les Champs Libres and 4.8 km from Rennes Centre. Every room at this hotel is air conditioned and has a flat-screen TV. Each room comes with a private bathroom fitted with a shower. ESC Rennes School of Business is 14 km from B&B Hôtel Rennes Sud Chantepie, while Roazhon Park is 7.3 km away. Rennes Airport is 8 km from the property. Hotel Rennes Preferred hotel ! This Novotel is located on the outskirts of Rennes, a 15-minute drive from Rennes St Jacques Airport and the Exposition centre. It offers modern rooms with air conditioning and free Wi-Fi. The Novotel Rennes Alma offers en suite rooms with flat-screen satellite TV with more than 40 channels. Room service is available. Novotel Rennes Alma provides daily continental or buffet breakfast which can be taken in the dining area or in the room. The hotel’s restaurant serves French cuisine and you can dine on the terrace. A bar is also at your disposal. Guests have free access to the outdoor swimming pool and a playground for children. The hotel has a 24-hour front desk and a business corner, which features a computer with internet. The Rennes Alma is 3 km from the TGV station and free private parking is available on site. Located a 10-minute drive from Rennes' city centre, Brit Hotel is 15 minutes from the airport and Exposition Centre. It offers soundproofed accommodation with free Wi-Fi internet access and flat-screen TV. Breakfast is served daily and Brit Hotel Le Castel has a restaurant that serves traditional and regional cuisine. Meals can be served on the terrace and guests can enjoy a drink in the lounge bar. The hotel provides free private parking. There is a bus stop outside the hotel, and a local bus services provides access to the city centre and the train station. The Rennes Périphérique ring road is just 1 km from the property. Located 8 kilometres from Rennes’ city centre, the Best Western Ker Lann offers an original and warm setting and individually decorated rooms. Guests have free access to the fitness centre. All rooms are en suite and each presents spacious and unique interiors designed to provide good nights’ sleep. Best Western Ker Lann Aeroport features an on-site restaurant, L'Unik, that serves traditional French cuisine. A snack service is also available 24/7. The attentive and service-minded staff will try their best to help you make the most of your stay in a friendly and peaceful atmosphere. Next to the exhibition centre and Ker Lann’s campus, the Best Western Ker Lann benefits from a privileged location only 2 kilometres from Rennes Saint Jacques Airport. Located in Bruz, 5 km from Parc des Expositions, Au Detour de Rennes boasts a sun terrace and views of the garden. Free private parking is available on site. The rooms, located on the first floor of the guest house, come with a flat-screen TV. A terrace or patio are featured in certain rooms. Each room is equipped with a private bathroom. Au Detour de Rennes features free WiFi. The owner has a cat. An array of activities are offered in the area, such as golfing, horse riding and cycling. The nearest airport is Rennes Airport, 6 km from the property. Première Classe Rennes Sud Est is a quality, budget hotel located 5 kilometres from the centre of the vibrant city of Rennes, the former medieval capital of Brittany. The hotel features well appointed rooms, each with satellite TV and a private shower. Also, a delicious buffet breakfast is served every day as well as light meals for lunch and dinner. There is also an informal bar where guests can relax and unwind. Easily accessible from the A11 motorway, and close to the St Jacques airport, Première Classe Rennes Sud Est is open 24 hours a day. Situated in Le Pont Réan, Manoir le Courtillon provides accommodation with a terrace and free WiFi. This bed and breakfast offers a garden. The bed and breakfast is fitted with a flat-screen TV. A continental breakfast is available every morning at the bed and breakfast. Rennes is 17 km from Manoir le Courtillon. The nearest airport is Rennes Airport, 11 km from the property. Located just 5 minutes from the centre of Rennes on the ring roads allowing easy access to all key locations, Hotel Mercure Cesson offers 4-star accommodation with free WiFi and private parking. It is located 5 km from Rennes Train Station and from Parc du Thabor. All of the spacious rooms feature a flat-screen TV with Canal+ channels and a private bathroom. A buffet breakfast is served every morning at Hotel Mercure Cesson. Guests can also sample gourmet cuisine in the on-site restaurant, which is open from Monday to Friday. Hotel Mercure Rennes Cesson is 6 km from the Parliament of Brittany. The nearest airport is Rennes-Saint-Jacques Airport, a 22-minute drive away. Next to the E50 motorway, the Kyriad Rennes Sud is a 10-minute drive from the city centre. All rooms have free Wi-Fi access, satellite TV and tea and coffee facilities. Full breakfast buffet is served daily and the hotel’s restaurant offers regional cuisine. The hotel provides a bar and 24-hour reception. The Kyriad Rennes Sud is a 15-minute walk from the train station. For guests travelling by car, a free private parking is possible on site. Guest accommodation Rennes Preferred hotel ! Corneille is set in Rennes. The accommodation is 2.1 km from the Les Champs Libres and has free WiFi. The holiday home is fitted with 2 bedrooms, a flat-screen TV and a fully equipped kitchen that provides guests with a dishwasher, an oven, a washing machine and a microwave. Rennes Airport is 8 km from the property. Offering an on-site restaurant and free Wi-Fi access, Grand Hotel is located in Pont-Réan, just 3 km from Bruz and 17 km from Rennes. The hotel’s garden is set on the edge of the La Vilaine River. Each of the guest rooms at Grand Hotel are simply decorated and some have a view of the river. They also include a private bathroom with a bathtub or a shower. Grand Hotel’s restaurant opens onto a terrace and serves traditional French cuisine with seasonal products. Breakfast is available every morning in the breakfast area, and drinks are proposed in the bar. The hotel is 3.7 km from Cicé-Blossac Golf Club and St Jacques Airport is 8 km away. The property offers free parking. Situated 1.7 km from Les Champs Libres in Rennes, Les Ormeaux offers accommodation with a kitchen. This property offers access to free WiFi. The apartment comes with a flat-screen TV. Guests can relax in the garden at the property. The nearest airport is Rennes Airport, 8 km from the property. Hotel l'Ortega Rennes Aeroport is ideally located a 10-minute drive from the centre of Rennes and Saint-Jacques Airport. Guests can easily access the exhibition centre, Courrouze shopping centre and Cisé-Blossac Golf Club. It offers 24-hour front desk service and free Wi-Fi access. This hotel boasts soundproofed rooms equipped with a private bathroom, telephone and flat-screen TV with Canal + and beIN Sports channels. A buffet breakfast is available each morning at the hotel from 05:00. There is also a brasserie serving evening meals. Free private parking is possible on site, and the nearby buses 6 and 57 provide direct access to the historic centre of Rennes and the train station. 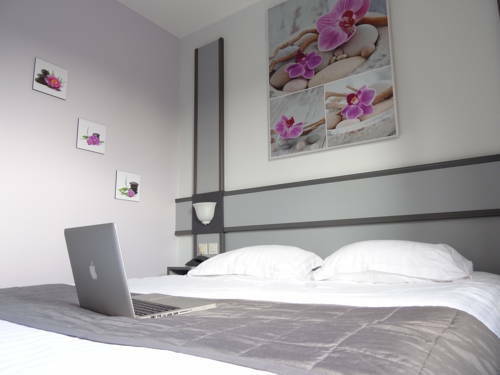 Situated in Rennes, 2.1 km from Les Champs Libres, Chez Casimir offers a living room with a flat-screen TV, and free WiFi. Guests have a private terrace. The apartment is composed of 1 bedroom, a living room, a fully equipped kitchen, and 1 bathroom. Rennes Airport is 8 km away. Apartment Rennes Preferred hotel ! BRASSENS - Appartement tout confort 2 chambres - rénové et calme is a property situated in Rennes near Les Champs Libres. Guests staying at this apartment have access to free WiFi. The apartment has 2 bedrooms, a flat-screen TV and a fully equipped kitchen that provides guests with a dishwasher, an oven, a washing machine and a microwave. The nearest airport is Rennes Airport, 8 km from the property. On the outskirts of Rennes, 5.3 km from the train station and a 9-minute drive from the airport, Campanile Rennes Sud - Saint Jacques has a bar with a lounge, 24-hour reception, and free Wi-Fi throughout. The rooms at Campanile Rennes Sud - Saint Jacques feature a flat-screen TV with Canal+ and BeinSport channels. The private bathrooms include a bath or shower and a hairdryer. A buffet breakfast is available daily and charges are applicable. Board games are available in the hotel's shared lounge. At a reduced rate, guests staying at Campanile Rennes Sud - Saint Jacques may have access to a fitness centre, located right next to the hotel. The property is 3.6 km from Parc Expo Rennes and 4.5 km from Roazhon Park. Free on-site parking is available. Bed and Breakfast Rennes Preferred hotel ! Located a 5-minute walk from the train station and the city centre in the south of Rennes, Les Chambres de Condate is a guest house with terrace and garden. Rennes Business School is ideally located 5 km away. The rooms at Les Chambres de Condate have an LCD TV and a private bathroom with shower and free toiletries. Free WiFi access is provided throughout. A homemade continental breakfast including bread, brioche and jam is served every morning. The property is situated 7 km from Rennes Airport and 2 km from Parlement de Bretagne. Free parking is available on site upon prior reservation.and bicycle storage is also available. Guest accommodation Poligné Preferred hotel ! The Bois Glaume is located in the Brittany countryside, a 30-minute drive south of Rennes. Set in landscaped gardens, this B&B offers period-style rooms with private bathrooms and antique furniture. The property owner can serve traditional cuisine and seasonal specialties for dinner upon request. Guests can relax in one of the residence’s elegant lounges or in the library, which has an open fire and free internet. The Château Du Bois Glaume is surrounded by oak trees and regularly maintained lawns. There is also a pond and a hot tub set in the garden. Guests can enjoy hiking and cycling in the countryside. The N137 motorway is just 1km away and free private parking is available. Resort Bruz Preferred hotel ! The Domaine De Cice Blossac is located in Bruz, 11 km south of Rennes. It is a 15-minute drive from the train station and offers accommodation with free WiFi access and free private parking. The Domaine De Cice Blossac offers rooms and suites on stilts. Set by the Vilaine Lake, the suites also have a private balcony overlooking the golf course and the countryside. Le Cicé, the bar-restaurant, serves gourmet dishes made from fresh, seasonal products. It offers several terraces and a clubhouse. A fitness centre is featured in this property. Guests can also enjoy the Cinq Mondes spa upon reservation and at an extra cost. It offers a hammam, a sauna and massages. Rennes Airport is 10 minutes' drive from the property. Located in front of the train station, this modern residence offers peaceful and functional apartments in the very heart of Rennes, the capital of Brittany. Free Wi-Fi access is available throughout. Each self-catering accommodation features a kitchenette and a private bathroom. The residence also offers hotels services such as a luggage room and a weekly cleaning service with a new set of bed linen and towels. Continental buffet breakfast can be enjoyed in the breakfast room, at a surcharge. Rennes city centre can be reached within 15 minutes by walk. Rennes 2 University is 15 minutes away by public transport and Rennes Parc Expo Convention Centre is 20 minutes away by car. Located 750 metres from Les Champs Libres in Rennes, this apartment features free WiFi. The apartment is a 5-minute walk from the South Parking of Rennes Train Station. The kitchenette comes with a microwave and there is a private bathroom with free toiletries and a hairdryer. Towels and bed linen are provided in this apartment. Roazhon Park is 3.4 km from Gite Paul Feval, while ESC Rennes School of Business is 4 km away. You can engage in various activities, such as cycling and hiking. The nearest airport is Rennes Airport, 6 km from Gîte Paul Feval. Situated in Rennes, just 1.4 km from Les Champs Libres, Gite Le Patio provides accommodation with free WiFi. Guests staying at this holiday home have access to a fully equipped kitchen. The holiday home is fitted with a flat-screen TV. The holiday home offers a sun terrace. Rennes Airport is 8 km away. Offering a garden, Rennes BnB offers accommodation in Rennes, just opposite Rennes Train Station. Free WiFi is available throughout the property. The accommodation is fitted with a flat-screen TV. There is a seating and/or dining area in some units. There is also a kitchenette, equipped with a microwave. A refrigerator and stovetop are also provided, as well as a coffee machine and a kettle. Every unit comes with a private bathroom with a bath or shower and free toiletries. Towels and bed linen are featured. The property also offers packed lunches. Pontchaillou Hospital is 2.3 km from Rennes BnB. The nearest airport is St Jacques Airport, 6 km from the property. Located opposite the train station in the city centre, the ibis Styles Rennes Centre Gare Nord features chic and comfortable accommodation, free unlimited Wi-Fi, a free buffet breakfast and free drinks. All of the stylish guest rooms are soundproofed and fully equipped with modern facilities including air conditioning and a flat-screen TV. Games and toys are available to keep your children entertained. With on-site parking, the ibis Styles Rennes Centre Gare Nord makes it easy to visit the area by car or on foot. Situated in the centre of Rennes, the Atlantic Hotel offers guests easy access to the theatres, Le Liberté, Les Champs Libres, the TGV and metro and the local restaurants. It offers comfortable and affordable sound-proofed rooms – all serviced by a lift and equipped with flat-screen TV, Canal+, BBC and Euronews channels. Free Wi-Fi internet access is available and iron facilities can be requested. Breakfast can be enjoyed on site or even in the comfort of your guest room. Hot drinks and water can also be bought at the hotel and a take-away breakfast can also be requested if you check-out before 07:00 from Monday to Friday or before 08:00 on Saturday, Sunday and bank holiday. A creperie and a restaurant can be found in the area. Rennes is a town rich in art and history seen in its medieval streets, 18th-century buildings, Parc Le Thabor and its market, Les Lices. Books and comics are available at the propery. Located in Rennes city centre, Hôtel Astrid is just a 2-minute walk from the train station. It offers soundproofed accommodation equipped with a flat-screen TV. Rooms at the Astrid are serviced by a lift, and have a private bathroom. They each have free Wi-Fi access. The Astrid Hotel provides a daily breakfast buffet. There is also a 24-hour reception and luggage storage facilities. Le Florin is located in Rennes, right next to the train and railway stations. The 24-hour reception hotel offers en suite rooms with a satellite, flat-screen TV and free WiFi access is available. Each heated and soundproofed room at Le Florin has a private bathroom with shower, a hairdryer and free toiletries. A desk and a wardrobe are also provided. A buffet, continental breakfast is served every morning. Different types of restaurants can be found within walking distance. Other facilities offered in the hotel include luggage storage. It is a 14-minute walk from Parlement de Bretagne and Rennes Airport is 6 km away. Below here is the hotels map of Bourgbarré. Names and details of Bourgbarré hotels can be shown on the map clicking on the prices icons.